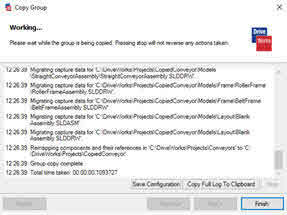 The Copy Group task copies the chosen data from the logged in Group to a new or existing Group. This is useful for carrying out tasks such as moving your implementations from a Development environment to a Production one. It can also be used to backup and restore old versions of your implementations. 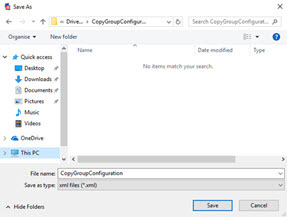 Follow the steps below to copy your group and also create a Configuration XML file to allow you to easily rerun the Copy Group Task with the identical settings applied. 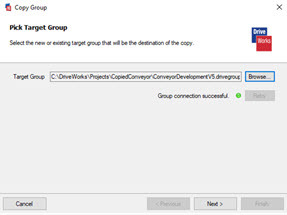 Within the Data Management Tool navigate to DriveWorks Tasks and select Copy Group. This will open up the Copy Group Wizard. Click the Browse... button to select the Target Group. This is the group the data will be copied into. 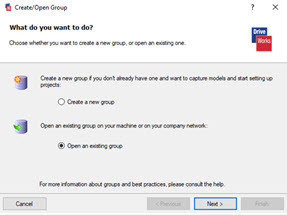 Select Create A New Group or Open An Existing Group. 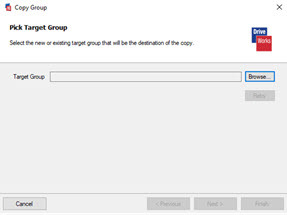 Follow the steps through the Group wizard to select a Target Group. A Group connection successful message will be displayed. This is an optional step and not necessary to be able to Copy a Group. 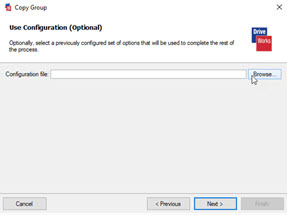 If you have previously run the Copy Group Wizard and saved a configuration file of your settings the file can be opened from this step. 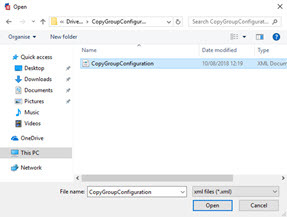 Please see the section How To Use A Copy Group Configuration File below for more information. Select the Projects to include in the copied Group. 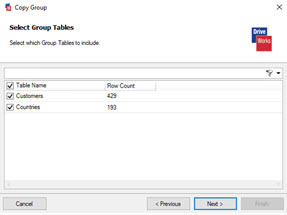 Select the Group Tables to include in the copied Group. Next select the Component selection type that is required. 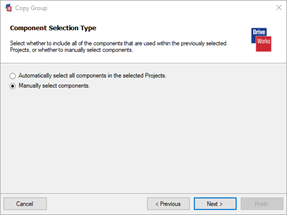 Automatically select all components in the selected Projects. All components that have been added to the selected projects will be included in the dataset. Components to be included in the dataset will need to be manually selected in Step 8b. 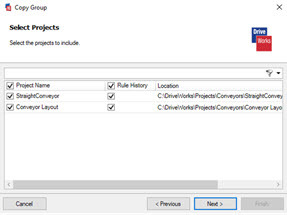 Automatically select components: Any new component sets added to any of the selected projects or models added to any existing component sets will be included in any dataset produced from the configuration file. Manually select components: When Top Level Components are checked any new models added to any selected component sets will be included in any dataset produced from the configuration file. Please note this is only required if Manually select components was chosen in Step 8. Next select the Captured Components to include in the Drive Package. Selecting the Top level components only check box will show only the parent component set models. Select any additional options that you want to include in the Drive Package. It is important to make sure that the Target Root Folder is not the same location as your Source Root Folder. Selecting Copy All Specifications and Copy All Generated Files and Information will dramatically increase the size of the group so consider if it is truly necessary to back these up. Review the files that are to be included in the copy. Files included from the selections made will appear with a black box in the checkbox next to them. To remove a included item simply uncheck the checkbox for the item in the list. Review the Summary. This details the creation process of the copy group. If changes are needed simply click previous to return to previous pages to edit what is being included. If everything is correct click Next. This will start the Copy Group process. 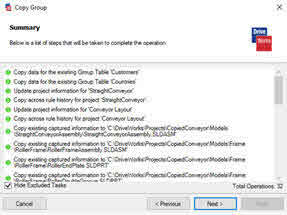 To create a configuration file of the settings applied in the previous steps follow steps 13 to 15 below. Otherwise click Finish to close the wizard. Click the Save Configuration button. This opens a File Explorer window. Select a location to save your configuration file and give it a name. 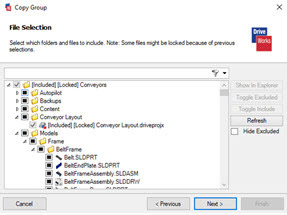 In this example a subfolder has been created in the DriveWorks folder within the Roaming Folder called BackupConfigurations. By default the file location will be C:\Users\[UserName]\AppData\Roaming. This does not have to be the location where the XML will be saved to. Click Save to create the file. Click Finish to exit the Copy Group Wizard. 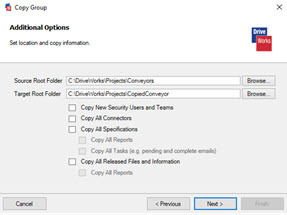 When you use the Copy Group Data Management Task there is an option to create a Configuration file. This file is an XML file containing a copy of all the settings you used when selecting what to put into the copied Group. This means you can replicate the same new Group without having to go through all the selection process again. To see how to create a configuration file please see steps 13-15 above. This guide shows how you would use a Configuration XML file to Copy a Group. Click the Browse... button to select a Configuration File to use to create the copy. Browse to the location of the Configuration file. To use the settings exactly as they come from the configuration file ensure Use current configuration is selected. 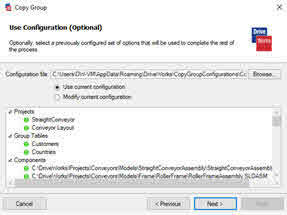 To amend the settings that come from the configuration file ensure Modify current configuration is selected. Review the Summary. This details the creation process of the copied group. 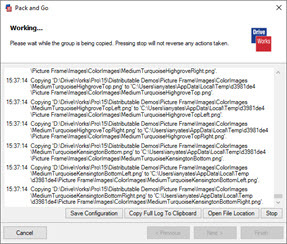 The Copy Group Tool is explained in more detail here.